Terra Power’s Traveling Wave Nuclear Reactor sounds great – BUT! TerraPower’s Nuclear Reactor Could Power the 21st Century. The traveling-wave reactor and other advanced reactor designs could solve our fossil fuel dependency IEEE Spectrum, By Michael Koziol 3 June 18, “…. ..In a world defined by climate change, many experts hope that the electricity grid of the future will be powered entirely by solar, wind, and hydropower. Yet few expect that clean energy grid to manifest soon enough to bring about significant cuts in greenhouse gases within the next few decades. Solar- and wind-generated electricity are growing faster than any other category; nevertheless, together they accounted for less than 2 percent of the world’s primary energy consumption in 2015, according to the Renewable Energy Policy Network for the 21st Century. To build a bridge to that clean green grid of the future, many experts say we must depend on fission power. ………several U.S. startups are pushing new reactor designs they say will address nuclear’s major shortcomings. In Cambridge, Mass., a startup called Transatomic Power is developing a reactor that runs on a liquid uranium fluoride–lithium fluoride mixture. In Denver, Gen4 Energy is designing a smaller, modular reactor that could be deployed quickly in remote sites. In this cluster of nuclear startups, TerraPower, based in Bellevue, Wash., stands out because it has deep pockets and a connection to nuclear-hungry China. 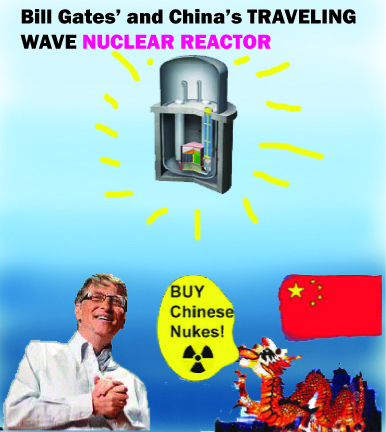 Development of the reactor is being funded in part by Bill Gates, who serves as the company’s chairman. And to prove that its design is viable, TerraPower is poised to break ground on a test reactor next year in cooperation with the China National Nuclear Corp. ……. “There are multiple levels of problems with the traveling-wave reactor,” says Arjun Makhijani, the president of the Institute for Energy and Environmental Research. “Maybe a magical new technology could come along for it, but hopefully we don’t have to rely on magic.” Makhijani says it’s hard enough to sustain a steady nuclear reaction without the additional difficulty of creating fuel inside the core, and notes that the techniques TerraPower will use to cool the core have largely failed in the past……. The TWR will be able to use depleted uranium, which has far less U-235 and cannot reach criticality unassisted. TerraPower’s solution is to arrange 169 solid uranium fuel pins into a hexagon. When the reaction begins, the U-238 atoms absorb spare neutrons to become U-239, which decays in a matter of minutes to neptunium-239, and then decays again to plutonium-⁠239. When struck by a neutron, Pu-239 releases two or three more neutrons, enough to sustain a chain reaction. It also releases plenty of energy; after all, Pu-239 is the primary isotope used in modern nuclear weapons. But Levesque says the creation of Pu-239 doesn’t make the reactor a nuclear-proliferation danger—just the opposite. Pu-239 won’t accumulate in the TWR; instead, stray neutrons will split the Pu-239 into a cascade of fission products almost immediately. In other words, the reactor breeds the highly fissile plutonium fuel it needs right before it burns it, just as Feinberg imagined so many decades ago. Yet the “traveling wave” label refers to something slightly different from the slowly burning, cigar-style reactor. In the TWR, an overhead crane system will maintain a reaction within a ringed portion of the core by moving pins into and out of that zone from elsewhere in the core, like a very large, precise arcade claw machine. To generate electricity, the TWR uses a more complicated system than today’s reactors, which use the core’s immense heat to boil water and drive a steam turbine to generate usable electricity. In the TWR, the heat will be absorbed by a looping stream of liquid sodium, which leaves the reactor core and then boils water to drive the steam turbine. But therein lies a major problem, says Makhijani. Molten sodium can move more heat out of the core than water, and it’s actually less corrosive to metal pipes than hot water is. But it’s a highly toxic metal, and it’s violently flammable when it encounters oxygen. “The problem around the sodium cooling, it’s proved the Achilles’ heel,” he says. Today, TerraPower’s lab is filled with bits of fuel pins and reactor components. Among other things, the team has been testing how molten sodium will flow through the reactor’s pipes, how it will corrode those pipes, even the inevitable expansion of all of the core’s components as they are subjected to decades of heat—all problems that have plagued sodium-cooled reactors in the past. TerraPower’s engineers will use what they learn from the results when building their test reactor—and they’ll find out if their design really works. The safety of the TerraPower reactor stems in part from inherent design factors. Of course, all power reactors are designed with safety systems. Each one has a coping time, which indicates how long a stricken reactor can go on without human intervention before catastrophe occurs. Ideas for so-called inherently safe reactors have been touted since the 1980s, but the goal for TerraPower is a reactor that relies on fundamental physics to provide unlimited coping time. The TWR’s design features some of the same safety systems standard to nuclear reactors. In the case of an accident in any reactor, control rods crafted from neutron-absorbing materials like cadmium plummet into the core and halt a runaway chain reaction that could otherwise lead to a core meltdown. Such a shutdown is called a scram. TerraPower plans to break ground on its test reactor next year in China. If all goes well, this reactor will be operational by the mid-2020s. But even if TerraPower’s reactor succeeds wildly, it will take 20 years or more for the company to deploy large numbers of TWRs. Thus for the next couple of decades, the world’s utilities will have no choice but to rely on fossil fuels and conventional nuclear reactors for reliable, round-the-clock electricity. Fission will probably not be the final answer. After decades of always being 30 years away, nuclear fusion may finally come into its own. Societies will be able to depend on renewables more heavily as storage and other technologies make them more reliable……….